In a protest to his government’s ban on internet access, the Chinese modern day crusader defied government orders and used his laptop to get internet access in Tiananmen Square. Determined to crack down and further prevent the spread of the protest, Chinese officials sent troops and a column of tanks. 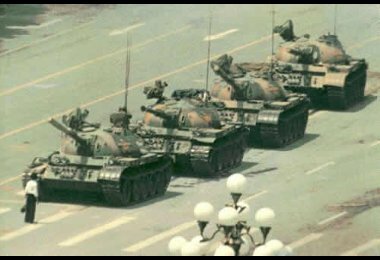 In a gesture similar the students protest in 1989, Chinese hero Wan Dum Fuk stood in front of the column of tanks preventing their entry into the square. One shot from the lead tank blew Wan into smithereens, with the only remains to identify him were his tea stained buck teeth. "Wan Dum Fuk, is a hero to us all" said his followers.